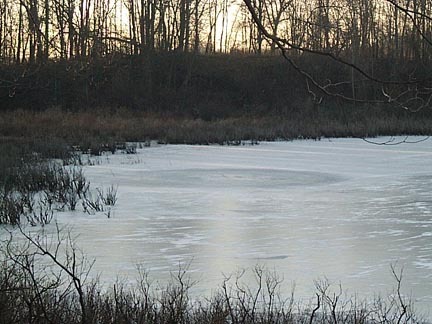 Mysterious ice circle discovered on December 28, 2003, by Vaughn Hobe at Mud Lake in Horton, Michigan, about fifteen miles south of Jackson. 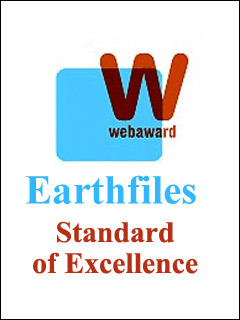 Investigators Jeffrey Wilson and Ted Robertson investigated on January 1, 2004. Photograph © 2004 by Todd Lemire, Michigan MUFON. Vaughn Hobe, Lapidary, Horton, Michigan: “My first thought was someone was back on the hill. My second thought was, ‘Who would be out on that hill like a night like tonight?’ It was like 15 degrees Fahrenheit and we had 40 mph winds blowing. It was cold! But it was such a brilliant white light! It was captivating. But it only illuminated a narrow area, about two inches wide at arm’s length over the hill about 900 to 1000 feet out. But it was enough to see that eight or ten trees being lit up between me and it. SO IT REALLY WAS A NARROW FOCUS WHATEVER THIS BEAM WAS? Yes, it was a very narrow focus. It was the most intense, brilliant white light. I couldn’t discern if the trees were being lit from in front by a light on top of the hill, or silhouetted from the back by a light behind the hill. The light had no color. It never wavered. I watched it for about twenty minutes, from 1:30 until ten minutes to 2 a.m. ET. IN THE 20 MINUTES THAT YOU WATCHED THE BRILLIANT LIGHT, DID IT HAVE A SHAPE? DID IT MOVE? It never moved and I could discern no shape. It was actually hard to look at at the top of the hill, it was so bright. IF YOU WERE COMPARING IT TO ANYTHING ELSE YOU HAVE SEEN, WHAT WOULD IT BE? On a rainy night, I have seen some of the new super white headlights ­ that brilliant, dazzling light with the glow you get on a wet night versus a dry night. But it had no shading of blue or shading of yellow. It was just pure white. AT AN ARM’S LENGTH DISTANCE, IT WOULD HAVE BEEN ABOUT WHAT SIZE? IF IT WERE TWO INCHES ACROSS, HOW HIGH WOULD IT HAVE BEEN? WHAT KIND OF SHAPE ARE YOU LOOKING AT? This is what I’m still working out in my mind here. But I would say that the light I could see was about three-quarters as high as it was long, so it might have been 1 1/4 inches by 2 inches, like a bar there. AND THE LIGHT THAT IT WAS CASTING DOWN AT AN ARM’S LENGTH DISTANCE, YOU THOUGHT WAS ABOUT TWO INCHES. AND YET EVEN THEN, AS BRIGHT AS IT WAS HURTING YOUR EYES, IT ONLY LIGHTED UP A FEW TREES? Right. It was like jet black to either side of it, it was so bright. IN THOSE TWENTY MINUTES, IT DIDN’T MOVE. HOW DID IT DISAPPEAR? I don’t know. I went to bed. I convinced myself it was the moon setting over the hill, because it was about that size as you would see a moon set on the horizon. WHEN DID YOU MAKE THE POSSIBLE LINK THAT THERE MIGHT BE SOMETHING OVER THERE? I didn’t make the link until we saw the circle on December 28, 2003. But starting the day after seeing the light, we had several days where we accumulated snow that had blown across the lake and accumulated at this end. Then at Christmas things started to melt and when we went out on the Sunday after Christmas (December 28, 2003). There in the snow it looked like someone had come down with a snowmobile and done a perfect circle and decided ‘The ice isn’t safe,’ and left. 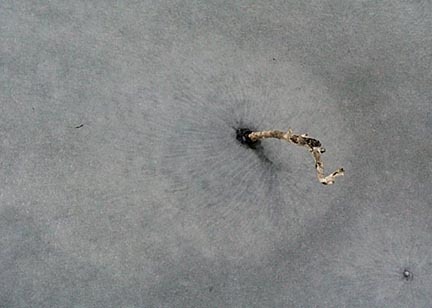 So to us it just looked like a 6-foot-wide or so jet black circle melted down into the snow. AT THAT POINT WHEN YOU FIRST SAW IT, WAS IT LIKE A RING? Right, not a solid circle. It was melted down through the snow. So you had snow in the middle and snow all around it. And then you had this dark ring that was melted down all the way to the surface of the lake. And a halo going around the outside ring, as if the snow had melted differently than if it had melted elsewhere. DID THE THOUGHT GO THROUGH YOUR HEAD AT THAT POINT ABOUT THAT STRANGE WHITE LIGHT YOU HAD SEEN ON THE NIGHT OF DECEMBER 18? Yes, immediately, because it was directly in line. And also because it was not there before. That ring had to have appeared some time before the snow fell on December 18 (2003). 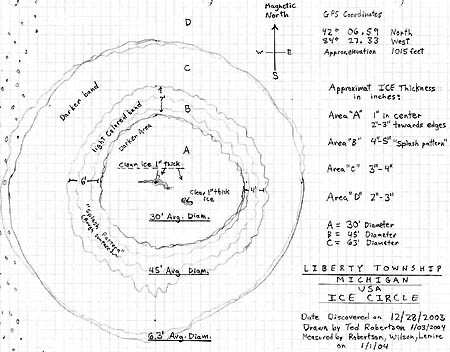 Information about the ice circle did not reach investigators until New Year’s Eve, December 31, 2003. 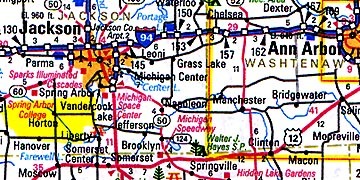 The next day on January 1, 2004, the research team that went to Mud Lake included: Jeffrey Wilson; Todd Lemire, Chief Field Investigator for the Michigan Mutual UFO Network (MUFON); Dr. Charles Lietzau; Ted Robertson; Roger and Nancy Sugden; and Zach Smith. The researchers reported that the full diameter of the whole circular area was between 62 feet (east/west) and 64 feet (north/south). 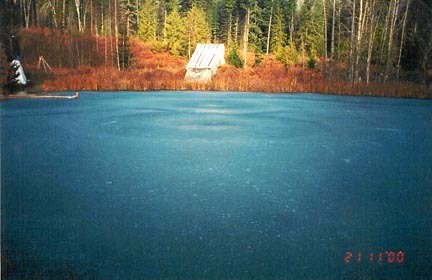 The thin ice circle at the center was only about one inch thick and varied from 28 to 32 feet, surrounded by a brighter and thicker (4-5 inches) white “splash pattern” which laid another 4 to 15 feet around the central circle. Further out was what the men called the “exterior edge” that varied between 4 and 13 feet wide. Given Vaughn Hobe’s report of the strange light above the hill and Mud Lake, I asked Jeffrey if it were possible that something fell down into the lake and created the lighter splash pattern? Jeffrey Wilson, Independent Crop Formation Investigator, Master’s Degree in General Science, Dexter, Michigan: “We considered that. We also considered that the description of the light beam was such that it was narrower as it got toward the ground and got wider as it went up higher. That might seem to indicate that the source had been at the ground level and as it got higher, the beam spread out wider. 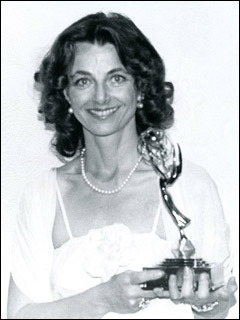 We considered both possibilities as to what the source, the direction the source was coming from. What we’re struggling with is that the water is only two or three inches deep before you start hitting the sediment underneath. And there is no sediment that is frozen in the splash pattern above, on top of the ice. It’s just completely clear water. 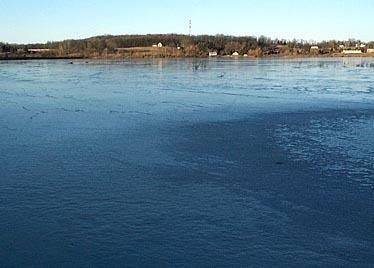 There is no sedimentation that is mixed in with the ice that has been splashed out from underneath down below. It’s not very deep water. That’s what we’re struggling with at this point. IF SOMETHING HAD HIT IN THAT SHALLOW WATER AND SPLASHED MUD, WHAT YOU’RE SAYING IS THAT YOU WOULD HAVE SEEN IT IN THAT SPLASH PATTERN. YES, AND IF IT’S NOT THERE, WHAT IS CAUSING THE DISCOLORATION OF THE SPLASH PATTERN? What we’re thinking of is that if it had been open water, because the wind was blowing, it could have splashed the water ­ the top layer of water ­ out on to the top of the ice. You wouldn’t necessarily see sedimentation going along with it. 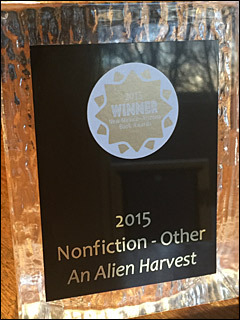 BUT STILL THE MECHANICS OF HOW IT WOULD HAVE BEEN MADE IN THAT SNOWSTORM ­ EVEN WITH CLEAR WATER IN THE CENTER ­ IS PUZZLING. Jeffrey Wilson contacted Dr. Brandon Brygadier to calculate the size of the light and they concluded: “Mr. 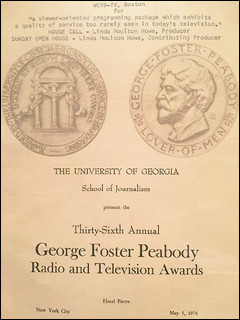 Hobe said he measured the width of the column as being two inches at arm’s length. I paced out the distance from the window he watched from to the crest of the hill which was 900 feet. 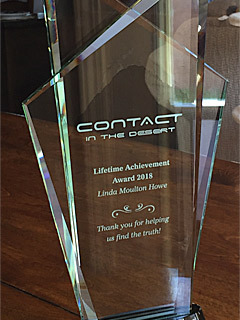 It was another 300 feet to the circle for a total of 1200 feet” from where Vaughn Hobe watched the light. Ted Robertson, Robertson Harpsichords and Ice Circle Diagram Maker, Ellettsville, Indiana: “The ‘splash pattern’ is like more white ice because I think it has air bubbles, like it’s been frosted up. And the darker ice is actually clear ice because it doesn’t have air in it. You can see it’s more undisturbed, more placid. That looks darker because you can actually see the undergrowth through the ice. IF THE WIND WAS RESPONSIBLE IN THE SNOWSTORM FOR MAKING THE SPLASH PATTERN, THE QUESTION STILL IS: WHAT MADE THE THINNER CIRCLE IN THE ICE IN A SNOW STORM? It’s almost as if it was melted or removed. But the second possibility is that a ring was cut in the ice where the splash pattern is, allowing the water to froth up and spill over from the central water disc that was cut out like a cookie cutter. Vaughn Hobe: “In the series of pictures on the Mud Lake circle, there is one of a small hole in the ice and the other of a plant sticking up through a hole and the tip of another next to it. The first picture is a close up of one a about twenty holes found about fifty feet north of the halo surrounding the circle. They are all in an area of ten by twenty feet. The picture of the plant was enclosed to point out a difference other than something sticking up through the hole. Notice both have a radiating radial pattern. Only the holes in this small area have small dark spots, visible in photo, surrounding them, those with plants or irregular shaped do not. A drill throwing off ice could account for the spots. I cut out a section with two holes before the ice disinegrated. It is in my freezer. Though and impact may explain some aspects of the circle’s appearance with the snow gone, I don’t think so. I think something was there that melted a ring down to the ice, perhaps into it but not through it, it would have floated off center in the wind. It also melted a halo around it a distance into the scrub as the scrub was from the outer edge of the ring. The center circle was melted at a different rate. Then they melted at the same rate until the snow was gone. The surface texture was different in all three sections. SO THIS IS HOW YOU GUYS KNOW IT WAS THREE TO FOUR INCHES OF ICE AND THREE TO FOUR INCHES OF CLEAR WATER AND ABOUT THREE FEET OF MUCK BELOW? That’s right! Reaching in there. And the ice was cracking. We heard audible sounds of ice cracking where people were clustered, but we didn’t fall in. COULD THE SPLASH PATTERN BE SNOW THAT WAS THERE MELTED AND THEN RE-ICED? Absolutely. In fact, I’m leaning toward splash. It looks sort of like it was built up. It was snowing at the time. It snowed, then melted, and probably snowed again and then probably melted. But it’s really difficult to say what this was. THEN THERE IS YET THAT THIRD SECTION, IF I UNDERSTAND CORRECTLY, THAT GOES OUT BEYOND THE FIRST MAJOR SPLASH PATTERN? Yeah, it’s like the whole thing is raised up a little bit ­ it’s like a splash pattern within a splash pattern. I don’t know if it was done in sections, but we can’t see a clear ring of cut ice because it has re-froze, or maybe it was never there. It’s very subtle and oddly shaped. Outer “splash pattern” beyond central thin circle and first “splash pattern.” Photograph © 2004 by Todd Lemire, Michigan MUFON. This is only ten feet from a reed bed which is right at the edge of the lake, so (circle) is not right in the middle. It fits into a cove, sort of. It almost seems placed. Like it’s not randomly put there. A VERY SPECIFIC POSITION IN A MILE WIDE LAKE, AS IF THERE WAS A REASON FOR IT TO GO THERE. And it is very close to where lights were spotted in the sky, although from where the gentleman pointed, it would have been on the land and this was more toward the lake. But he was at his house when he saw the light. And we think it was about 1,000 feet from the lake from his house that night. We actually paced the distance. IF YOU WERE MEASURING WITH A RULER THE CIRCLE, CENTER CIRCLE, WHAT DO YOU ESTIMATE ITS THICKNESS IS? AND WHAT DO YOU THINK THE SECOND SPLASH PATTERN THICKNESS IS? AND WHAT THE THIRD SPLASH PATTERN THICKNESS? Good question. We haven’t been able to measure through the ice the farthest distance, judging by how the ice cracks when you walk on it. Actually, in the center of this formation, the ice was only an inch thick. Then, it was two inches and I would say when it hits the splash pattern, it was anywhere from 3 to 4 or 5 inches, and then it got thinner with the darker band of ice. I’m not sure how thick that was, but it seems thinner because of the cracking and then it seemed to like taper out to the rest of the pond. But this whole thing seems like a raised surface where the center is thin. IF I UNDERSTAND CORRECTLY, I’M SEEING THAT THE CENTER CIRCLE THAT WAS 28 TO 32 FEET IN DIAMETER IS ABOUT ONE INCH THICK AND THEN YOU GO OUT FOR ANOTHER 4 TO 15 FEET FOR 3 TO 5 INCHES THICK. AND THEN BEYOND THAT, IS THE THIRD RAISED SECTION THAT WOULD BE HOW THICK? Probably about the same, 4-5 inches. We didn’t actually pierce through that, but it seemed thicker than the rest of the lake because it was raised up and that’s very odd. DID YOU CORE INTO ANY OF THE ICE BEYOND THE PATTERN TO SEE WHAT THE THICKNESS OF THE ICE IN THE REST OF THE LAKE WAS? Good question. In one part of the lake, even up to yesterday, it was water and that was maybe a half mile long. So half the lake was not frozen. The only reason this was there was because it was on the side of the lake that got cold shaded by trees, more northern exposure. We never cored any of that ice. We could see plants sticking up because it is a very shallow lake. 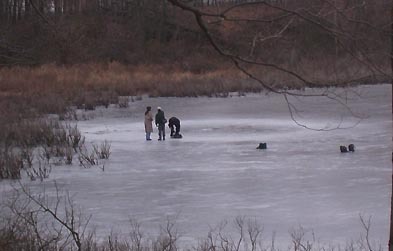 WOULD YOU SAY THAT THE REST OF THE LAKE THAT WAS FROZEN WAS THINNER OR THICKER THAN THAT ONE INCH CENTER OF THE CIRCLE? 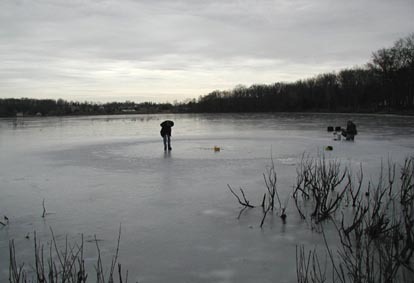 Researcher Jeffrey Wilson checked for radioactivity and magnetic field anomalies at the center of the Horton, Michigan, ice circle at Mud Lake on January 1, 2004. 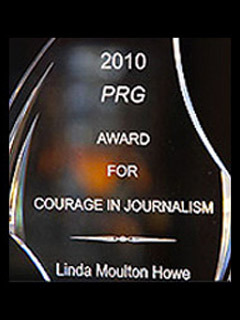 Photograph © 2004 by Ted Robertson. “Ice circles usually come in two varieties. You’ll see a complete whole circle melted right through the ice, so the whole circle is open water. 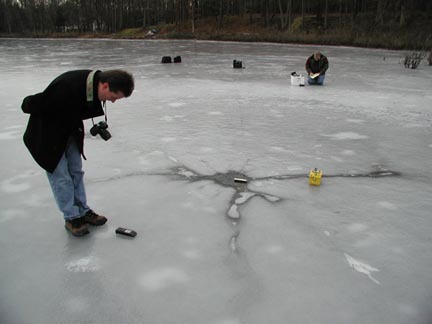 Or, you’ll see a ring cut through the ice several inches wide. This one (Horton, Michigan) seems to be like a third type, one we haven’t seen before. The closest to it would have been in Whitley County, Indiana, back in 1996-1997, that winter. 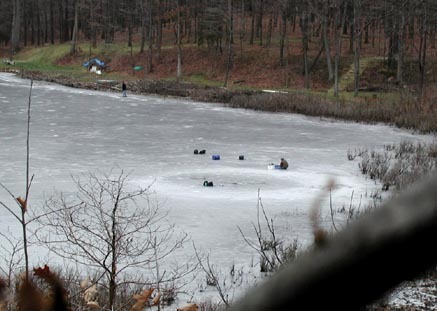 There were two ice circles on a lake in Whitley County, Indiana. There have been various reports of ice circles in the United States. I want to say maybe three or four other ones reported in the last ten years. There have been maybe six or eight reported in Canada in the last ten years. Also, there was also a ring with a notch in it that showed up in Churchville, Maryland, in 2000. 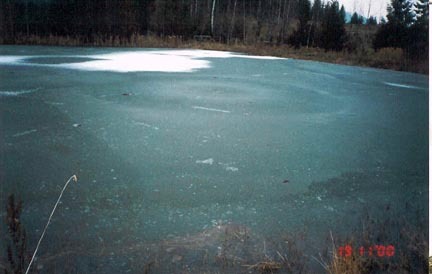 Above and below are photographs of two ice circles on a small pond in the back yard of Mr. and Mrs. Excelex, in the Okanagan Valley half way between Salmon Arm and Kamloops, British Columbia, Canada, taken on on November 19 and November 21, 2000. Photographs © 2000 by Mr. Excelex. Initially, we thought this Mud Lake ice circle could have been like a meteor impact or something. But again, there is no plant material or anything that has splashed up and out. It’s only water. So, because the water there is so shallow, we can’t see a way if something impacted there with any velocity to create such a wide area that has been affected, how that could not have brought up any of the material from below. And that’s what we’re kind of puzzled by. It’s not as if something went in there and had a massive impact and picked up a bunch of stuff and created the circle. That’s not the case. There is clearly something that has removed the ice in a circle and somehow left this water debris field that has re-frozen outside of creating the splash pattern. 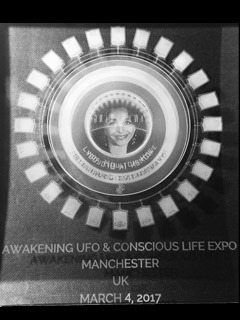 AND THE CIRCUMSTANTIAL LINK IS THAT COLUMN OF WHITE LIGHT THAT WAS SEEN? 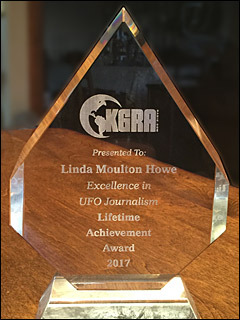 Over the past few years, Vaughn Hobe has seen near the same hill and Mud Lake area large, orange glowing spheres at least 25-feet in diameter hovering in the sky. He says the orange is the color of a ripe pumpkin and that he has only seen one sphere at a time, never in groups. The closest approach was once about 200 feet. The orange spheres have been stationary and then move off, seeming to dip down toward the hill beyond his house where he saw the bright, white bar of light on December 18, 2003.